You are here: Home > M.C. Records To Release 1st Solo Record By Sherman Holmes of The Holmes Brothers July 21! M.C. Records To Release 1st Solo Record By Sherman Holmes of The Holmes Brothers July 21! Northport N.Y. – On July 21, Sherman Holmes will release his first solo recording in his 50+ year career. 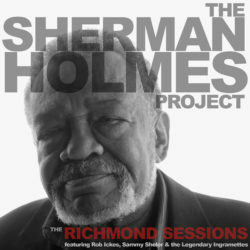 The Richmond Sessions by The Sherman Holmes Project carries on the spirit of the Holmes Brothers by re-imagining songs and making them their own. The record will be released by M.C. Records and maintains a bluesgrass/gospel vibe throughout that surprises and delights. Sherman Holmes’ solo debut The Richmond Sessions can’t help being a milestone: It’s the esteemed singer and bassist’s first recording since the passing of his brother and musical partners, Wendell Holmes and Popsy Dixon, both in 2015. But his solo debut, dedicated to the memories of Wendell and Popsy, is no somber affair. The blend of bluegrass, gritty rock & roll and joyful gospel will be familiar from Holmes Brothers days. And with some of his strongest vocals on record, the album shows Sherman is still an artist in his prime. Copyright © 2019 M.C. Records.